Apple CEO Tim Cook fell sharply in Glassdoor's tech CEO rankings this year, while Facebook's Mark Zuckerberg catapulted to No. 1. Apple employees who reviewed their CEO on Glassdoor.com say they still like Tim Cook -- just less than they liked him last year. Glassdoor, which collects employees' reviews of their companies and ranks their leaders by approval rating, said Cook dropped to 18th on the list of most-liked tech CEOs in 2013. 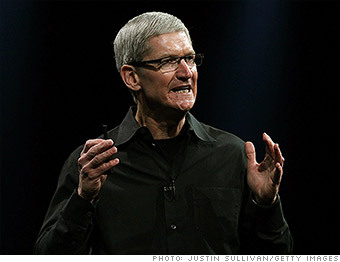 Last year, Cook not only topped the tech CEO list, he was also No. 1 on Glassdoor's list of CEOs across all industries. Cook's approval rating fell four percentage points from a year ago, though it stands at still-strong 93%. While Apple (AAPL) is undoubtedly still a white-hot tech company, the past year has brought a few spots of trouble. In September, Cook issued a rare public apology about Apple Maps, which he admitted "fell short." Meanwhile, Apple shares have lost more than a third of their value in about six months on concerns about waning demand for the iPhone.